Use this contact box for all inquiries or to purchase this painting. Originals are one of a kind, so make sure it is available. Due to its large size, this painting can only be shipping to the 48 continental states of the USA. This painting is protected with a professional varnish to protect it for many years of enjoyment. It can be lightly dusted or wiped with a clean, lint free cloth. Never use cleaners on it! Acrylic paintings are the easiest paintings to care for, especially when they are protected by a good varnish, as this is. Peacocks are so beautiful. Their iridescent feathers look like eyes with hearts in the center. 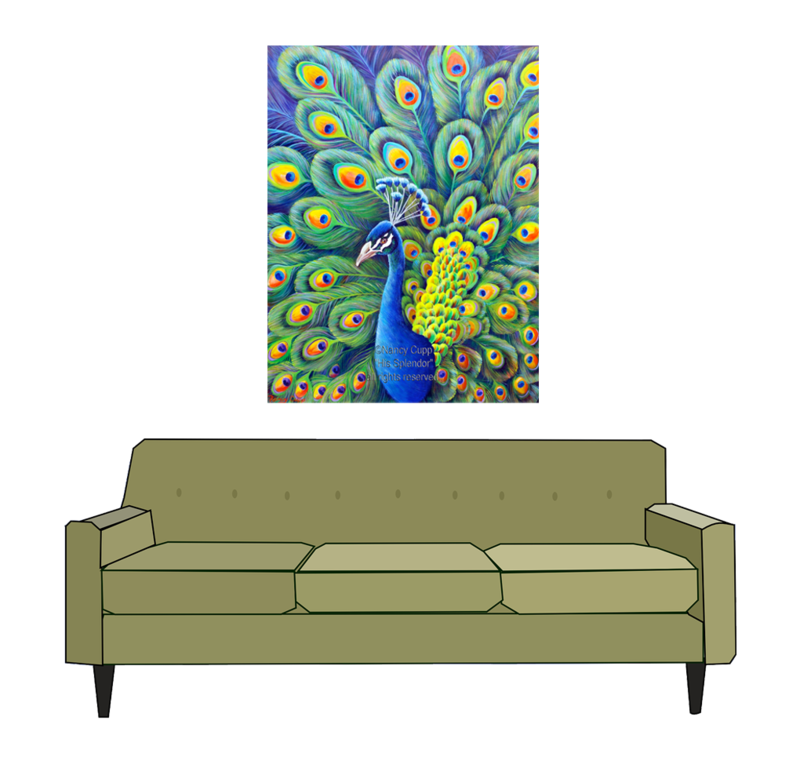 To paint this, I studied some peacock feathers that I have. The more I looked at the feathers, the more frustrated I became because the colors of the feathers kept changing. I experimented with some iridescent paints that also change color as you look at it from different viewpoints and in different lighting. It reminded me of a worship seminar that I attended. The speaker said there are four angelic beings in Heaven, whose only job throughout eternity is to say one phrase over and over…Holy, Holy Holy, Lord God Almighty, which was, and is, and is to come! The angelic beings never tire of saying this because they are revealing a new aspect of God’s glory each time they say it throughout eternity. She gave the illustration of how a diamond sparkles as it turns in the light. Just think, God’s magnificent splendor and glory goes on forever and we will never have enough words to describe it. These four angelic beings also have six wings each full of eyes, which reminds me of the eyes on the peacock. The “pupil” of the eyes on the tail of the peacock are heart shaped, reminding me of God’s love. Creation once again points to the creator.